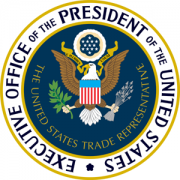 "The Office of the United States Trade Representative (USTR) is an agency of more than 200 committed professionals with decades of specialized experience in trade issues and regions of the world. We negotiate directly with foreign governments to create trade agreements, to resolve disputes, and to participate in global trade policy organizations. We also meet with governments, with business groups, with legislators and with public interest groups to gather input on trade issues and to discuss the President's trade policy positions. USTR was created in 1962 and has offices in Washington, Geneva, and Brussels. The headquarters of the Office of the United States Trade Representative are located in the Winder Building at 600 17th St., NW in Washington, D.C., a pre-Civil War building of historic significance that narrowly escaped demolition in an urban renewal city program in the 1970s. Named after its builder, William H. Winder, the Winder building was Washington's first "skyscraper" when it opened for business in 1848. The government purchased the building in 1854. Originally designed as office space for the U.S. Army and Navy, the building has housed a variety of government tenants over the years, including a military arms museum. Around the time of the Civil War ordinance of the Winder Building included the Quartermaster General and the Navy's Bureau of Ordinance and Hydrography and later, the headquarters for the Bureau of Military under Judge Advocate General Joseph Holt. In 1865, the Winder roof served as a signal station of the Washington detachment of the U. S. Signal Corps for communication via flag signals to military fortifications and camps around Washington. In 1888, the building was transferred to the Department of Treasury. The Second Auditor of the Treasury and his staff occupied the building exclusively for many years. During World War I, the Army occupied part of the building. In 1949, the U.S. General Services Administration, which is the building manager for many government facilities, took control of the Winder Building and has maintained it ever since. During the 1970s, the White House used the building, which was undergoing renovation. At the end of the Carter Administration, the Council on Wage Price Stability occupied the building for a short time. USTR took up residence in 1981."